Students taking part in Career and Technical Education (CTE) classes at the Allen County Career and Technical Center (ACCTC) and the Allen County-Scottsville High School this year can expect challenging, inspiring, and practical instruction in a wide range of subject areas---all designed to prepare students for life beyond high school. AC-S students have the opportunity to enroll in multiple classes which fall under the Career and Technical education umbrella. Each class is part of a career pathway which gives the student the chance to earn certifications that are recognized by business, industry, and higher education. The certificates enable students to enter the work force while still in high school or immediately following graduation. In Automotive Education under instructor Todd Stamps, students will be learning to repair vehicles---giving the student a skill that could lead to work or simply a foundation which allows a “shade-tree” mechanic to change their mother’s oil on a lazy Saturday afternoon. Stamps will also create for his students a feel of what it’s like for a real-world worker in an automotive dealership. The auto students and SkillsUSA---the club for students in auto shop---will also host the Second Annual ACCTC car show this year. The show not only provides the community with a car and truck show that features classic restored cars from across decades but teaches the students the practical skill of organizing a large-scale event. Students in Drafting classes, under the instruction of Dolorse Rice, will have an opportunity to earn certificates for future work as well as a developing a skill that could be useful for themselves, friends, or family when building or remodeling a home. Rice notes that her students will be using their 3D printer more and more as well as learning a new software program. Rice adds that her architecture students will continue to work with the community in providing house plans for homeowners or builders for a very reasonable fee. If requested, drafting students will also work in community partnerships. Paul Spears will be teaching Industrial Maintenance (IMT) classes. The IMT Program offer hands on training in hydraulics, injection modeling, robotics, CNC plasma, welding repair, fabricating, and electrical for residential/industrial. Students also have the option to take several of the IMT classes as dual credit where they receive credit both in high school and also for college through SKYCTC (Southcentral Kentucky Community and Technical Center). Co-Op will give the students the opportunity to get on the job experience while in the high school. 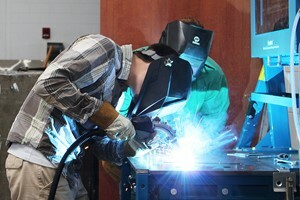 Educator Matt Keith oversees the Welding program at ACCTC. This year, students will be using several new pieces of equipment to enhance their learning. Keith adds that a new endeavor this year will involve his students in a project to revive the train at the old L & N Depot in Scottsville. Business and internet technology educator Monica Bean will lead her Digital Literacy and Multimedia students into learning about a wide range of office and business related practices. Students will have the opportunity to earn Microsoft Office Specialist certifications and the foundation of Adobe products---skills for employment in office settings or a skill that someone might need in managing a farm, small business, or a home. All business students have the opportunity to join FBLA - Future Business Leaders of America. Bean’s classes (along with Meredith Trammell and Cindy Scott’s business and internet technology classes) and FBLA will also be involved in several activities throughout the year. The list includes the Patriot Printing Press---printing services for the community---guest speakers, community/business tours, community service projects such as Pink Out and Relay for Life. Students who take marketing classes at the ACCTC learn about the foundations for a career in the growing marketing area or just for someone who will one day be promoting their own business or a community event. In addition, students can earn an ASK certification. Students interested in health care can get a start to a career in the ever-growing field through Health Science/Nursing classes and involvement in the HOSA (Health Occupations Students of America) club. Bewley points out that students can earn their CNA (Certified Nursing Assistant) certification which opens the doors for employment. Bewley’s HOSA students will be working with Medical Center Health's Fair in the fall, host at least two blood drives with the American Red Cross and participate with Allen County Primary Center health fair. ACCTC educator Rick Roberts will guide students in the growing field of Computer Science and Internet Technology. “All our computer programming classes are project driven to give students an opportunity to code solutions in areas of academic and professional interest,” Roberts said. “Unlike many schools in our area, we offer both AP (Advanced Placement) Computer Science courses. AP Computer Science A is taught using the JAVA programming language while the new AP Computer Science Principles course uses Python coding. Our game design students create objects in Blender3D that can be posted on several web asset sites while in high school. Our game design sequence of three courses is working to offer an industry certificate in Unity3D. Anyone joining an Interapt cohort would have opportunities to work as an app developer about completion of their Interapt apprenticeship. Many IT and computer science jobs requires a two-year or four-year degree. Roberts adds that ACCTC students have a new opportunity this year. “Students from Allen County has been invited to apply for the Interapt outreach cohort for several local high schools and being hosted at Barren County Technical Center,” Roberts explained. “Students that choose this program would be designing apps for companies throughout Kentucky. Roberts notes that his students will be building upon their success from last year. CTE also includes Family and Community Science (FCS) and Agricultural Education. The classes for FCS and Ag are housed at the high school but the career pathways fall under CTE guidelines. FCS students will also take part in several learning activities and community service projects. Educators Nikki Towe and Brandon Weaver will guide ag students toward opportunities in agricultural related business and industry---from the family farm to agri-business areas. Ag students will have guest speakers, take field trips to university farms and agriculture businesses operations as well as hands-on instruction and work in the classroom. Students can also work in the community. “We have cgriculture coop students employed and other underclassmen working in agriculture business and production,” Towe added. Students and/or parents with any questions about the Career and Technical Education opportunities for AC-S students, career pathways and clusters, or the educational opportunities are encouraged to contact Carter at the Allen County Career and Technical Center.